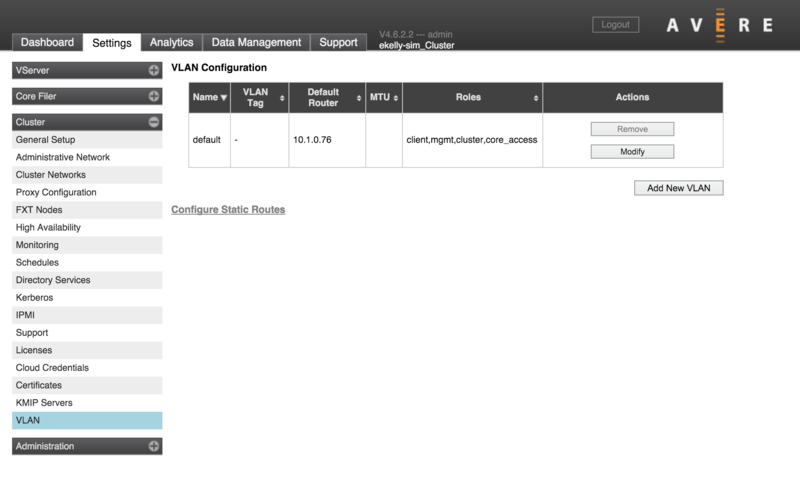 The VLAN page lets you customize the network environment of your cluster by creating VLANs. This page also has a link to the page for creating static routes. 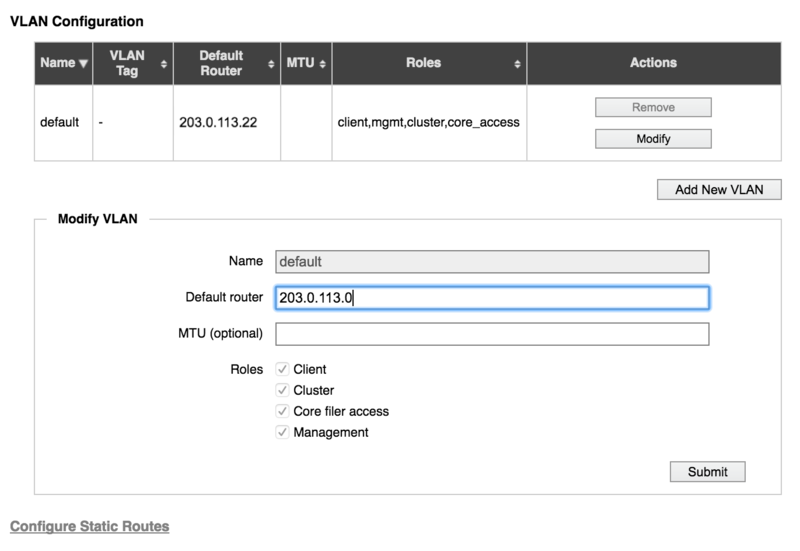 One VLAN, named default, is automatically created for your cluster. This VLAN cannot be removed or renamed, but some of its settings (including the router address) can be modified. Choose a VLAN to modify, or click the Add New VLAN button to configure a new VLAN. VLAN settings include the following. Enter a name in alphanumeric characters with no spaces. The underscore character (_) is valid, but not hyphens or other punctuation marks or symbols. The name must be shorter than 127 characters. Supply an integer tag to identify this VLAN. The tag number must be a unique integer between 1 and 4094. The default router that the VLAN should use. Avere OS assigns all VLANs that use the same router to use the same forwarding information base (FIB). If you want VLANs to use different forwarding tables, you must assign them to different routers. The maxiumum transition unit setting for this VLAN, in bytes. This number must be an integer between 512 and 9000; typical values include 1500 and 9000, but make sure that your system can handle the value that you set. 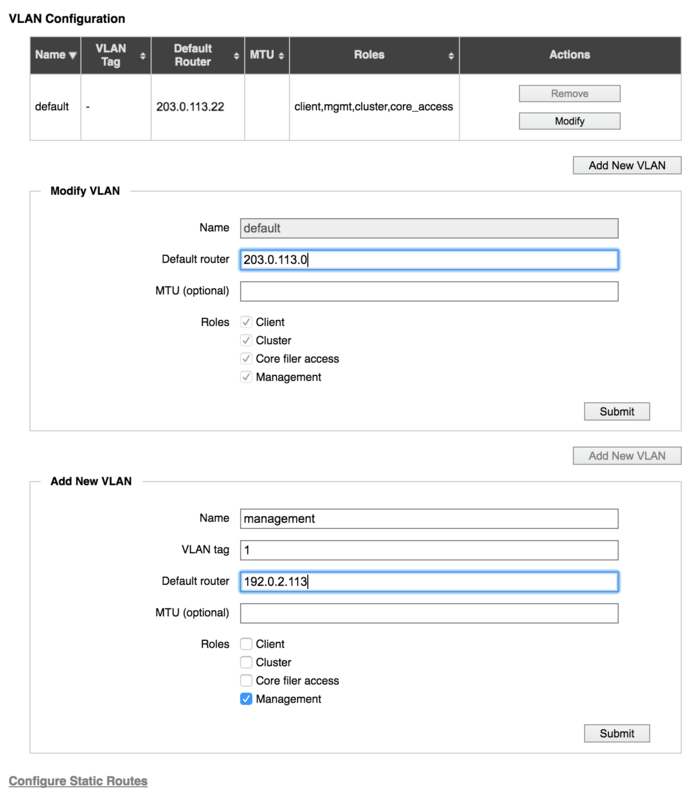 If you do not set a specific MTU the VLAN uses the setting from the default VLAN. Client - The VLAN is used to communicate between the FXT nodes in the cluster and the clients. VLANs with this role can be selected to serve individual IP address ranges defined in the the VServer > Client Facing Network page. Cluster - The VLAN is used to communicate between the FXT nodes in the cluster, and also between the cluster and core filers. Cluster VLANs must use the default gateway assigned to the cluster. VLANs with this role can be selected when specifying address ranges for cluster networks (on the Cluster > Cluster Networks page). Management - The VLAN is used to communicate between a management machine and the FXT nodes in the cluster. The IP addresses used by the VLAN are not locked to a single node. VLAN roles only determine whether or not the VLAN can be selected when configuring particular types of networks. Read VLAN Roles for more information about where each type appears. You can configure static routes for a VLAN in order to direct how the vservers communicate with the cluster, and how the cluster communicates with the core filers. This is particularly necessary if your core filers are located on different VLANs, and the cluster needs a gateway other than the default to reach them. Static routes are configured on a separate page that does not appear in the left menu of the Settings tab. Click the Configure Static Routes link at the bottom of the VLAN page to access the Static Routes page. 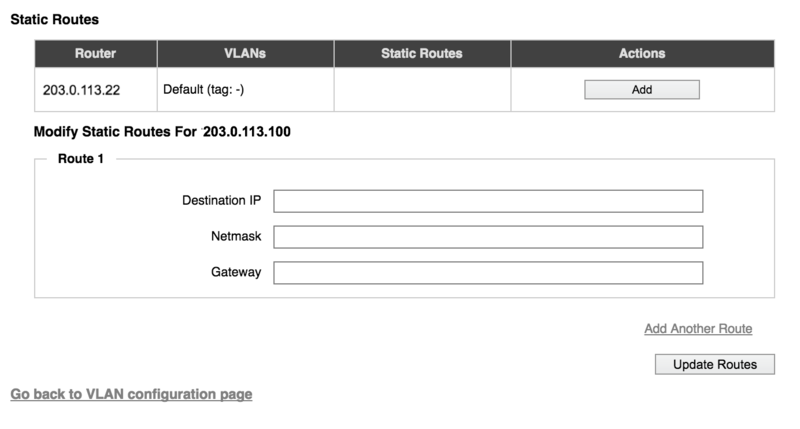 The Static Routes page shows a list of VLANs by router, and the static routes (if any) that are defined for the VLAN. Click the Add button to create a new static route for that VLAN. To create a new static route, click the Add (or Modify) button in the row with the VLAN that needs the static route. Fill in the route parameters. The mask to use with this static route. The netmask can be provided in in IPv4 dotted format or /number_of_bits format. Click the Add Another Route link to create more than one static route at a time. When finished, click the Update Routes button. After static routes are defined, you can change or delete them. Changes and deletions apply to all static routes for that VLAN. Delete - Remove all existing static routes from the VLAN. Avere OS does not give a warning if you choose this option. Add - Create a static route for a VLAN that does not have any.